By 1871 the Denver & Rio Grande Railroad had reached Greenland and a new village was born. 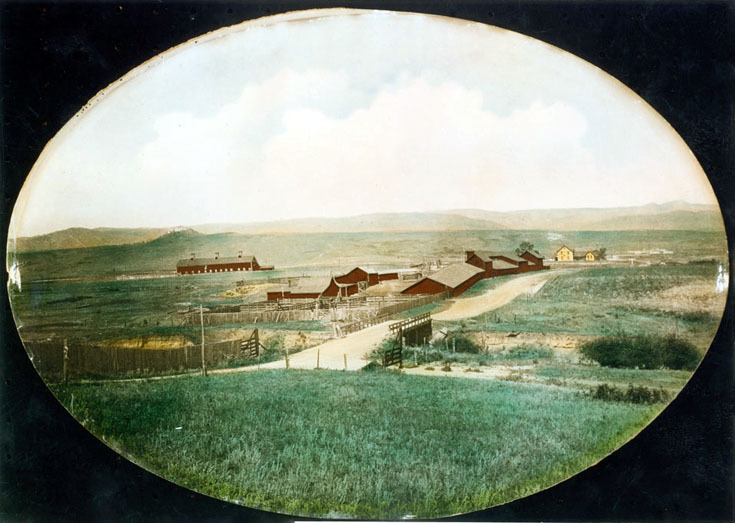 One of the first subdivisions in Douglas County, the town was platted as a 20-acre town site in 1875 by Fred Solomon prior to Colorado becoming a state. The layout was quite typical for a rail road town with a “Front Street” parallel to the train tracks intersected with written numbered street names followed by presidential names. (see the Town og Greenland in the sketch below) As with most early pioneer settlements, survival depended on the trade and shipping of products grown or harvested from the land locally. Large quantities of lumber, grain, clay, potatoes, milk, and building stones were shipped out of Greenland. In the early part of the century the Palmer Divide was one of the greatest potato producing areas in Colorado. One year 400 railroad cars of potatoes were shipped from Greenland. In 1898, the Colorado Business Directory showed a population of twenty-five people and by 1910, fifty citizens. At the turn of the century Greenland had a post office, several stores, two blacksmiths shops, wagon making shop, saloon, school, 2 railroad depots, and a hotel. Mary and Charles Riggs and J.P. Riggs were among the first settlers along with I.J. Noe, C.B Kountz, Charles Allis, A.B. Daniels, a founder of the Daniels and Fisher Store in Denver, and Charles Nimerick. The Riggs family ran a 5&10-cent store and another merchandise store in town. With an elevation of 7,000 feet, the natural grasses are some of the richest in Colorado. Milk producing shorthorn cattle were raised on surrounding ranches, which in turn supported several local creameries. Milk would be brought daily to Greenland to be sent by train to Colorado Springs or Denver. The area surrounding Greenland included many sawmills, which in turn supplied the railroad ties for the railroads and lumber to growing communities. Carpenter Creek, a watershed for the Palmer Divide and running through the middle of town, has flooded many times causing train derailments and destruction of property. The most recent in memory was the June 1965 flood, which started with 16” of rain in Palmer Lake and the surrounding Greenland area and subsequently sent a 30 foot wall of water through Castle Rock and on to Denver doing millions of dollars in damage to these and other cities and the countryside. 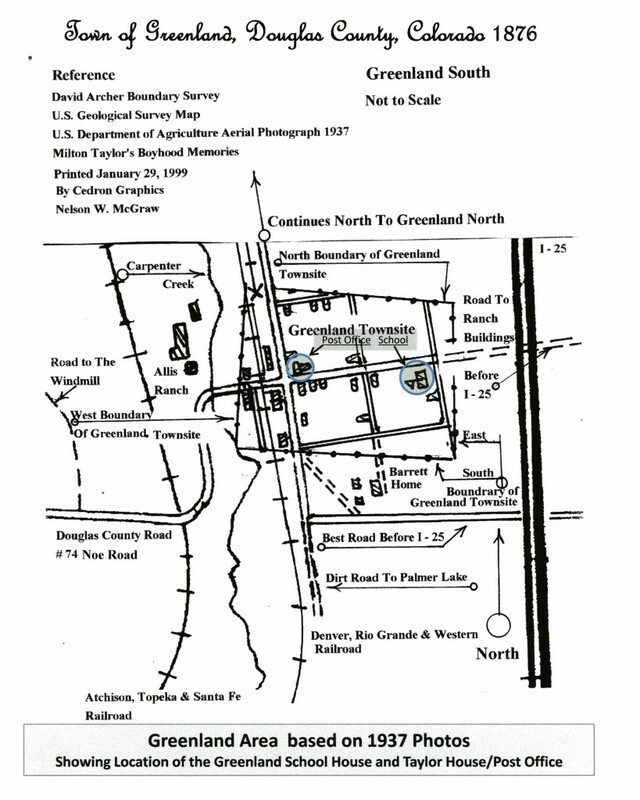 In 1997 Douglas County purchased all ninety-six of the vacant lots in the Greenland town site to enhance their open space programs. In addition, the Allis Ranch, located directly across the street now has a conservation easement, and with the Greenland Ranch included in the I-25 conservation corridor, the area will continue to support cattle and abundant wildlife. Additionally, a portion will now be utilized for public recreation. The Greenland Trail and Open Space on the west side of the expressway has 3,600 acres open for public enjoyment. Greenland is located at an average of almost seven thousand feet and for this reason grains are selected to meet the requirements of the altitude as the seasons are short which require seeds of the nature of fast maturing qualities. While the seasons never seem to be the same, one year watermelons may be raised and perhaps the next year the corn will not have time to ripen. The past season was a very good one beautiful rainfall and a sufficient amount of sunshine to keep vegetation growing. Wheat averaged about twenty five bushels to the acre, oats about thirty and barley in some places made thirty. _____ or speitz as introduced last spring and it averaged about thirty three. Not much of the corn is husked so an estimate of the productiveness is difficult. However barely every farmer or ranchman raises enough matured corn to fatten the winter supply of pork. Cattle raising is a resource of some consequence, each farmer raising on an average of a car of feeder steers and heifers. N. R. Alderman shipped in a car of first class steers this fall, receiving the highest market price for any sold that day, which was $5.75 and they averaged 1,0?? pounds all of which he had raised himself. Several farmers have taken to the thoroughbred shorthorns and have made neat profits from them. Dairying is carried on a small scale, nearly everyone milking enough defray wages or running expenses. A Sketch of the Plot Layout for the Town of Greenland Colorado based on 1937 data. 1937 Sketch Showing the Approximate location of Building within the Town. 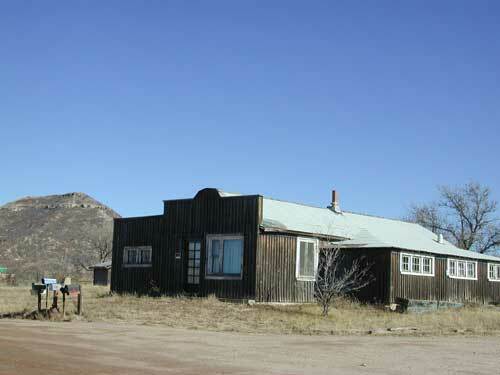 The Existing Greenland School and a Post Office Building have been High-lighted.